NB: This is a project I am 100% dedicated to pursue to greatness. I believe, starting today 'Sharebility' is going to increasingly become popular throughout Uganda and the world. 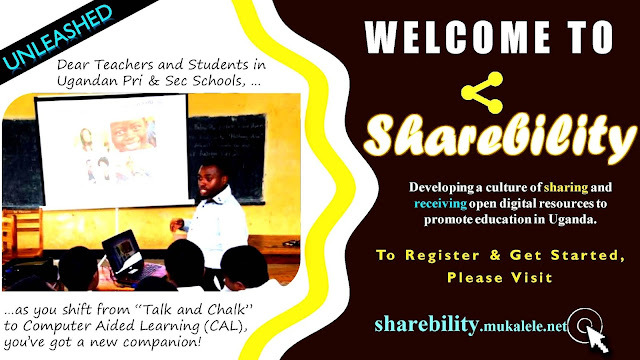 This is a platform for sharing and receiving open digital resources to promote Education in Uganda's Primary and Secondary Schools. We're pooling Notes, Past Examination papers plus their marking guides, Practical Practice Exercises for all subjects and all classes, as well as building a network of generous resourceful teachers ready to engage and guide students out there . The system is still in early stages of development but we didn't want to build it alone, we want to involve you. We need your contribution in terms of resources, testing and review. Please leave a comment here to tell us what you think. Lets build this for Uganda! for sure this is of great importance!!!! !